These frogs are highly variable in color, and can range from light to dark brown, bronze or black, with green to blue stripes, spots, or bands covering them. Weight - Less than an ounce. Colour - Dark brown, bronze or black, with green to blue stripes. Favourite Food - Small insects, such as ants, spiders, s, termites, beetles, mites; tadpoles eat rotifers, protozoans, woody detritus, other tadpoles. Habitat - Forest floor, among leaf litter. Main Prey - Small insects, such as ants. This species occurs in the humid lowlands from southeastern Nicaragua on the Atlantic slope and southeastern Costa Rica on the Pacific versant to northwestern Colombia (Golfo de Uraba on the Caribbean coast and the lower Atrato River drainage and Bahia Solano on the Pacific coast) (sea level up to 1,000m asl). In 1932, 206 specimens of D. auratus from Taboga or Taboguilla Islands, Panama were released in the upper Manoa Valley, Oahu, Hawaii in an attempt to control non-native insects (Silverstone, 1975; McKeown, 1996). A few feral populations of D. auratus descended from these animals still persist in the mountains and valleys of Oahu. Poison dart frogs live in the rainforests of Central and South America and on a few Hawaiian islands.They were introduced to Hawaii by humans and have flourished there. Found primarily in lowland rain-forests as well as young forests and older cocoa or citrus plantations. They've even been found in garbage dumps on the fringes of settlements near forests or groves, and some within the city limits of Panama City. They adapt well to variances within their natural habitat and are a sturdy, easy to care for dart frog. They are primarily ground dwelling frogs that will occasionally climb to seek out new habitat or to seek out food. These frogs are highly variable in color, and can range from light to dark brown, bronze or black, with green to blue stripes, spots, or bands covering them. This is an abundant species that is often seen and regularly recorded throughout its range. There is great geographic variation in the appearance of this species; over 15 distinct colour morphs of wild D. auratus have been recorded. (Heselhaus, 1992). The blue morph of D. auratus present on the Pacific side of Panama is believed to be threatened with extinction (Heselhaus, 1992). Vibrant but toxic, poison arrow frogs range from less than an inch to two and a half inches in body length. There are more than 100 species of poison dart frogs, varying in color and pattern. The black and green species has black spots, the strawberry or blue jeans frog is all red with blue legs, the yellow-banded species appears painted with yellow and black. Color shades vary among frogs within a species. It is the skin that contains the frog's poison. In the wild, this species has been known to congregate in sun exposed clearings, but in captivity they are a relatively shy species of dart frog. Handling is strongly advised against unless absolutely necessary, as these frogs will stress extremely easily. Wild caught specimens are still mildly toxic, and it is recommended to wash your hands before and after if you must handle them. Captive bred specimens do not have the same toxins in their skin as their wild counterparts, and while it is still recommended to wash your hands before and after handling them, they are not considered poisonous. Females are extremely territorial and aggressive towards each other, often competing for monopoly of the resident males. Male frogs care for the tadpoles, and the males that take the best care of the little tadpoles are often in high demand among females! It is recommended to provide ample room for your frogs or to simply have only one female and up to two males per cage. Males will also defend territories, but not to the same degree as females. A cage equivalent to at least 10 gallons is recommended for a pair, or a medium glass terrarium can work as well. Larger cage sizes are highly recommended, and a cage that is 18 x 18 x 18" is a more ideal size to permanently house multiple frogs. Within the cage, the frogs need fairly high relative humidity almost constantly, so substrate and cage furnishings need to not only contribute to high humidity but be able to last in the moisture rich environment. This means live plants are more suitable than fake ones as a primary source of hiding spots and cover, and not only are they aesthetically pleasing but they help immensely with the relative humidity in the cage. Because the Auratus are so shy naturally, the more hiding spots available to them, the more secure they will feel and thus the more they will be out. Suitable hiding spots that will also encourage natural behaviors such as calling and mating activity include coconut domes, bamboo hollows, small caves, tortoise shell hides, rock outcrops, and of course naturalistic bromeliads and tillandsias. At least 50% of the floor space needs to remain open for the frogs to navigate and hunt their tiny prey items, which is why a larger cage full of live plants for cover is highly recommended despite the small size of these frogs. For substrate, a bedding that can retain moisture is a must. Orchid bark can be used, but needs frequent misting and constant monitoring to ensure it is not drying out too much nor becoming soggy and stagnant with too much water. Better options include eco earth, plantation soil, cocosoft, New Zealand Sphagnum Moss, green sphagnum moss, or compressed forest moss are all excellent bedding options. Combining different beddings is an excellent way to create your ideal substrate, and encourage a small amount of decomposition, which will allow prey items such as spring tails to propagate within the tank. Use of small amounts of vermiculite can help keep the bedding oxygenated and fresh. Lighting for these frogs does not need to be any more intense than the lights needed to help maintain and grow the plants. For cages 12" or less, a simple Natural Light compact fluorescent is enough to light up the cage and provide enough light for the plants inside to grow. For taller cages, a 5.0 compact fluorescent will be needed. Higher quality strip lights will provide light across the entire length of the cage, and ZooMed brand 5.0 strip lights are an excellent option for higher quality lighting at an inexpensive price. The better the lights, the prettier your plants, and the healthier your frogs will be! In the wild, these frogs experience daytime temperature ranges between 77 degrees F and 86 degrees F, and can tolerate drops into the low 70s at night. A 40 watt red bulb should provide more than enough heat for the average terrarium, and during the day a 40 watt day bulb can be used to increase the ambient temperature within the cage. Ideally, no additional heat should be used with these frogs as the heat lights tend to dry out the air within their cages. These frogs will thrive at the average room temperature of 78 degrees, without any additional heat whatsoever. These frogs originate in extremely humid tropical rainforests, where average humidity is typically well above 75%. Occasional dry periods do occur, and they can tolerate them, but if you notice your frogs never seem to leave their water bowls, that is a sign that your relative humidity is much too low. When a frog lives in a cage with high enough humidity, they seldom need to seek out the moisture of a water bowl. Use of a fogger is highly recommended for an easy and aesthetically pleasing way to increase humidity within the cage. A hand spray bottle or pressure sprayer are also excellent options to mist or spray down your cage to keep humidity up. Misting the cage at least once daily is a must, and to encourage calling and mating behaviors, misting up to 3 or 4 times a day is recommended. Dendrobates auratus have small mouths for their size, and require very small prey items. This includes, but is not limited to, fruit flies, spring tails, rice flour beetles, and pinhead or 1/8" size crickets. In the wild, these frogs will eat an immense variety of small insects, and as much effort as possible should be made to give them a wide variety of prey items in captivity. With some effort, more unusual prey items can be found and offered, including aphids, large fruit flies (Drosophila hydei), fire brats, house flies, alternate species of crickets such as gryllodes, and various alternate species of springtails. All feeder insects should be dusted with a high quality calcium powder containing D3, and once or twice a week a reptile multivitamin should be used as well. Male frogs go through an elaborate ritual to attract a mate. The males vocalize, a loud trill sound, to attract females. Once the courtship ritual is complete, the females deposit dozens of eggs on leaves. The eggs are encased in a gelatinous substance for protection against decay. 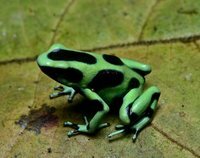 The mating season of D. auratus occurs throughout the entire rainy season of the rain forest, from mid-July through mid-September. Male frogs go through an elaborate ritual to attract mates. The males first fight among themselves to establish territories, which are then fixed for the remainder of the mating season. The male then attracts a female with vocalizations consisting of trilling sounds. Part of the mating behavior involves the frogs rubbing against each other. Once the courtship ritual is completed, the female deposits up to six eggs under leaf litter. The eggs are encased in a gelatinous substance for protection. These eggs will develop into tadpoles over a period of two weeks while the male continues to occasionally check on them. The young feed from the yolk sac of the egg. Their bright colours are warnings to other animals of skin toxins. The poison allows them to be diurnal unlike most other frogs that are nocturnal. The practice of the male carrying the eggs on his back cuts down on the amount of time the offspring spend as defenseless eggs and tadpoles in waters that teem with predators. As a result, these frogs can make do with fewer but larger eggs, which supply more yolk for each developing embryo. These frogs, due to their warning colouration, live a much safer life in the hazardous jungle than other frogs. However, they are over collected for the pet/zoo market. Also extensive jungle clearance destroys the humid understory they require. There is a general loss of suitably wooded areas and collection for the international pet trade. Owing to the apparently low fecundity of this species, the possibility exists that over harvesting, especially in the more rare morphs, might contribute to localized population declines. Approximately 18,500 specimens of D. auratus were reported in trade over the period 1991 to 1996. The great majority of specimens were live animals, exported from Nicaragua, and presumably destined for the herpetological pet market. The USA was by far the largest single importer of D. auratus (about 15,000 animals in total) during this period. It is believed that the trade in Nicaragua was decreasing by 2002 because of over collection. McKeown (1996) states that populations on Oahu are highly sensitive to destruction of their habitat and over collection. Museum specimens of this species have been found to have chytrid fungi, the current impact of this pathogen on D. auratus is not known. Poison dart frogs are also known as poison arrow frogs. They get this name because of the hunters living in the rainforest using the skin toxins on their darts and arrows. Some frogs are more poisonous than others. The toxins come from the ants or other insects they eat in the wild. Captive-bred poison dart frogs are not toxic due to their different diet.